Everlast Gym Mats are the industry standard! 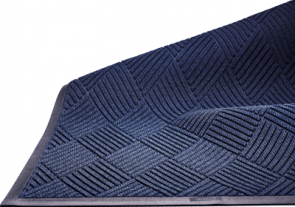 These tough mats are capable of absorbing training shock and provide supreme comfort underfoot. 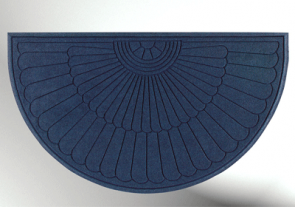 Mats are laser cut and designed to fit together seamlessly. Available in 1/4" and 3/8" thicknesses. 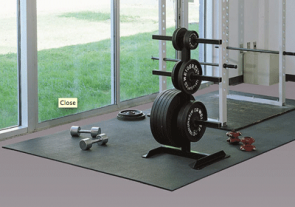 Everlast Gym Mat Interlocking Tiles are the most popular gym and fitness facility floor tiles in America. These tiles measure 2'x 2' and are designed to piece together seamlessly. 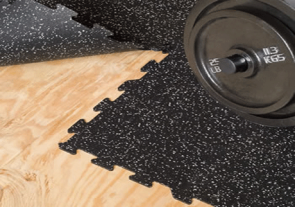 Our most popular gym flooring option! Equinox Gym Mats are stand-alone floor coverings ideal for a variety of applications in gyms, fitness centers, and other athletic facilities. Piece together to cover large floor spaces. Capable of withstanding shock and abuse from heavy weights. 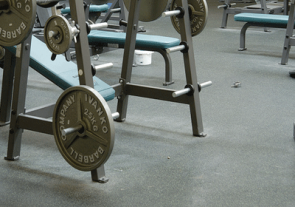 Mega Lock Gym Tiles feature a nearly indestructible construction perfect for covering gym and fitness center floors. Great for covering custom floor spaces! Noise canceling and vibration inhibiting! Diamond-textured surface for superior traction. Designed to piece together seamlessly over large floor spaces. 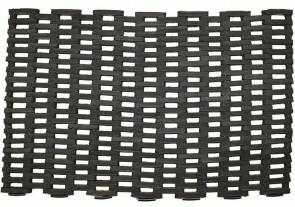 Turtle Tile Shower Matting raises walking surfaces to facilitate water transportation below. Keep walkways and other large areas dry and safe! Piece tiles together seamlessly for custom applications. 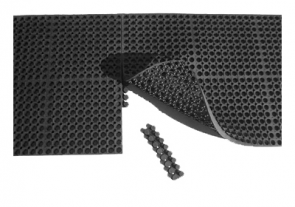 Go Green with these 100% recycled PVC plastic drainage tiles! Our Eco Recycled Tile Garage Flooring is made of 100% recycled PVC plastic! Reduce your carbon footprint without sacrificing quality! Modular and portable, these tiles are an excellent alternative to expensive epoxy concrete surfacing. 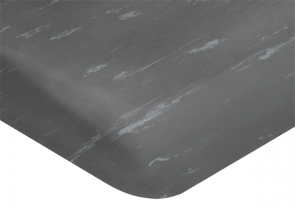 Marble Top Anti-Fatigue Mats now feature a new non-porous vinyl surface for exceptional abrasion and chemical resistance! 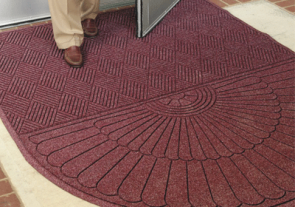 These anti-fatigue floor mats also have a permanently antimicrobial treatment that kills bacteria. Exceptional comfort comes from its micro-pure sponge base. New: Improved non-porous vinyl surface for added chemical resistance! Unique Nitrile rubber composite stimulates blood flow to combat fatigue. Perfect for use in laboratories, pharmacies, and even packaging and postal areas. 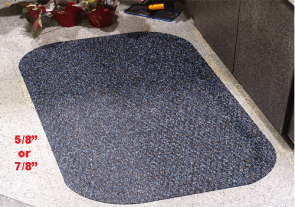 Marble Top Anti Fatigue Mats are ½” thick and are ideal for dry areas where comfort and productivity are important. 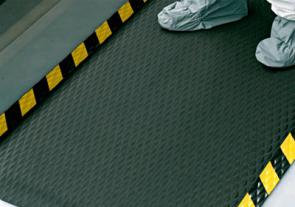 SMART Top Anti Fatigue Mats are ideal for preventing worker fatigue. 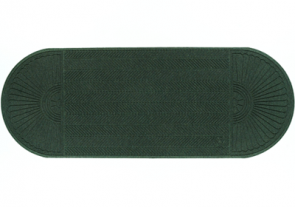 These anti-fatigue floor mats are economically priced and "Green." Built five times stronger than a typical sponge mat. 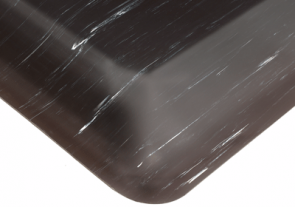 Resilient sponge base is called Rebound - a 100% recycled urethane composite. Available in two thicknesses: 1/2" and 7/8". Comfortable and functional in dry industrial applications. 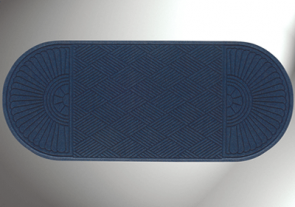 UltraSoft Diamond-Plate Anti-Fatigue Mats provide unparalleled comfort that results in enhanced employee productivity and morale. Made of double-thick Nitricell sponge base that is PVC loaded with Nitrile rubber for exceptional comfort, rebound, and long life. Comes in 9/16" and 15/16" thicknesses. Resistent to abrasion and most chemical spills. Also available with colored borders for maximum safety awareness! 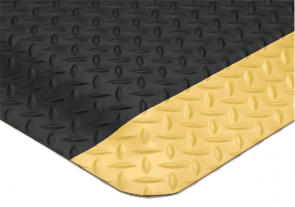 Our Diamond Plate with GritWorks mats are guaranteed to increase traction by at least 50%! Made specifically for areas where grease and oil accumulation must be controlled. Made of 20% recycled content! Now with safety beveled edges for safe foot and wheel traffic. Choose from SpongeCote (9/16") or UltraSoft (15/16") thickness. 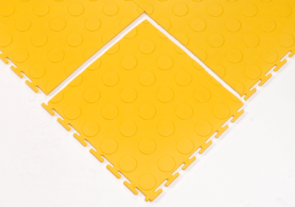 SMART Diamond Plate Mats are economical and Green solutions for preventing worker fatigue. 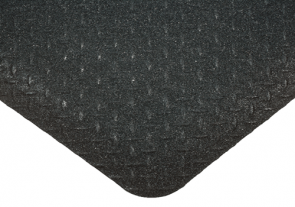 Diamond Plate surface with a 100% recycled urethane composite sponge base. 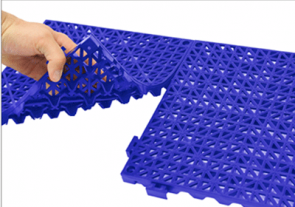 These floor mats are most effective in dry industrial applications. Available in two thicknesses: 5/8" and 1". Colors: Black and Black with Yellow Border. Environmentally Green Rating with 80% recycled material! Corrugated SpongeCote Anti Fatigue Mats readily adapt the worker to the workstation by providing superior cushion and comfort all day and night. Colors: Black or Black w/ Yellow Borders. Safety edges beveled with a 1/2" overall thickness. 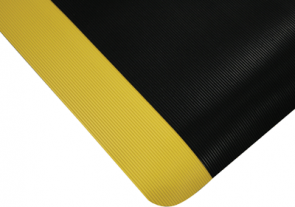 Chemical resistance and yellow safety borders for your work areas. 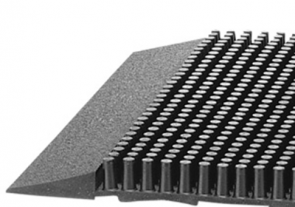 Nitricell® sponge base rubber/PVC compound designed for superior comfort and long life. 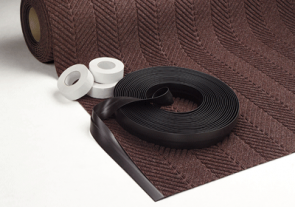 Hog Heaven mats are constructed with a 100% commercial grade Nitrile Rubber surface for supreme comfort and durability. Hog Heaven comes 5/8" or 7/8" thick for unparalleled comfort. Hog Heaven is the standard in anti-fatigue matting. 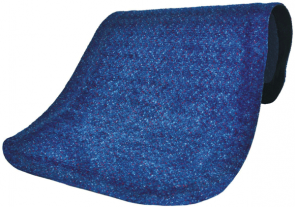 Soft Nitrile cushion stabilizes footing while increasing blood flow throughout the legs and lower back. The industry standard! 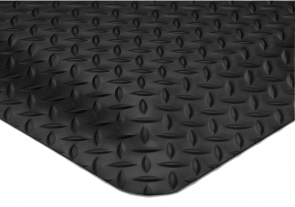 Hog Heaven Fashion Anti-Fatigue Mats are manufactured with a 100% commercial grade Nitrile rubber for supreme comfort, durability, and skid and slip resistance. Comes 2' and 3' wide. 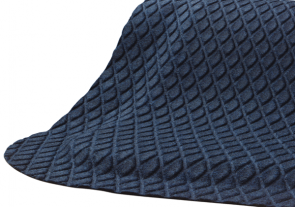 Soft Nitrile cushion stabilizes footing while increasing blood flow to minimize worker fatigue. Hog Heaven: the standard in anti-fatigue! 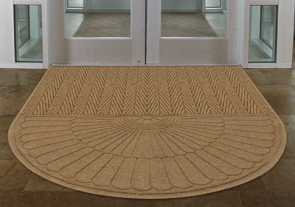 These mats are manufactured with a 100% commercial grade Nitrile rubber fashion fabric surface for supreme comfort, durability, and skid and slip resistance. Soft Nitrile cushion stabilizes footing while increasing blood flow throughout the legs and feet, minimizing worker fatigue. The standard in anti-fatigue matting! 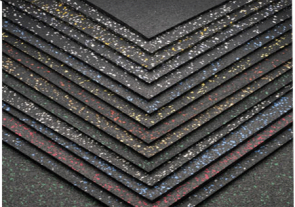 Hog Heaven Confetti Anti Fatigue Mats are constructed with a 100% commercial grade Nitrile Rubber surface for supreme comfort and durability. Comes 5/8" or 7/8" thick for unparalleled comfort. Confettie colored Nitrile rubber surface adds to interior décor! Nitrile rubber compound stimulates muscles of the feet and legs to fight fatigue. Soft Nitrile cushion stabilizes footing while increasing blood flow throughout the legs and feet. 24/7 drainage matting is one of the most popular for industrial areas. 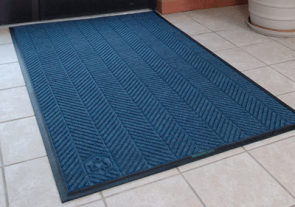 These Nitrile rubber mats work 24/7 to keep employees comfortable. Modular 3' x 3' mat is perfect for single workstations, or to interlock on all four sides to cover large areas. 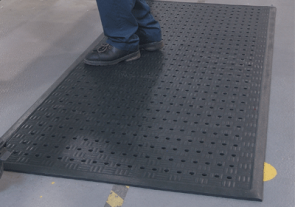 WorkSafe is available in a stand-alone or interlocking sections and is also offered with an optional 2" wide safety bevel that is unattached to the mats in a variety of colors. 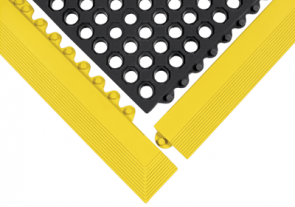 Any size or configuration is available with these workstation mats and available connector strips. Any size or configuration available using our linkable connector strips. WorkSafe is an excellent choice for wet areas or in applications where are wood shavings or other debris.